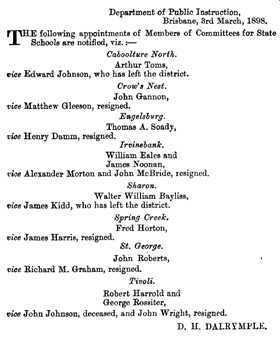 Was any of your ancestry on a Queensland school committee? If so, this data set is a must for anyone exploring their family history or building a family tree.A wonderful genealogy tool, this database indexes 12,657 names from Notices in the Queensland Government Gazette between 1876 (when the School Committee notices commenced) and 1899. The Gazette Notices cover more than 300 different schools from all regions of Queensland including well known schools such as South Brisbane, Bulimba, Bundaberg, Charleville, Charters Towers, Cairns, Mackay, Townsville and Warwick and others less well known such as Alsatia, Boggy Creek, Chinaman's Creek, Frederick, Lord John Swamp, One-Eye Waterhole, Postman's Ridge, and Te Kowai. Appointments are for those persons elected at a general or annual general meeting whereas those appearing as vice are appointments made when a vacancy occurs during the term of a committee. Resignations are only listed when they have occurred mid-term and not when a member has failed to stand for re-election at an annual general meeting. Hence, some people will appear only once whereas others will be appointed several times. When resignations occur, the Gazette usually indicates the reason, generally death or movement from the district, both of which are useful to the family historian in tracing an ancestor. Since the entries have been transcribed as they appear in the Gazette, the index contains some apparent anomalies. For example, surnames in some cases the one person may appear with two or three different spellings i.e. Stewart / Stuart, Weinholt / Wienholt, Trenfield / Tronfield, Consley / Cousley to name a few. As with differences in the surname, the same person can appear with different given names i.e. George DOBSON was appointed to the committee at Frederick in 1882 but it was Thomas DOBSON who resigned from the Frederick committee in 1884. What were the duties of School Committees? Initially, the duties of School Committees were, in general terms, "to see that the non-sectarian principle of the system is maintained inviolate and to take care that all the Board's regulations and instructions are faithfully and efficiently carried out". There were also other duties including "keeping the school building in repair, making sure it is used for proper purposes, providing sufficient quantities of furniture". One other duty required them to use "their influence with parents to induce them to send their children to school" and to report "the conduct of the teacher to the board". Obviously they formed a key role in keeping the schools functioning satisfactorily. "A school committee may be appointed for any State School for the purpose of advising and assisting the Minister in the management thereof. Of such committee three members shall form a quorum. In appointing school committees the Minister may be guided, in the case of new schools, by the recommendation of the subscribers to the building fund; and, in the case of schools already established, by the recommendation of a majority of the parents of the children attending the school. The school committee shall choose one of their number to act as chairman, one to act as secretary and to conduct the correspondence with the Department, and one to act as treasurer to take charge of funds locally subscribed. Should any officer of the committee die, resign, leave the district, or cease to act, the other members must supply his place from among their number, and the change must be intimated to the Department without delay. It will be the duty of the secretary to intimate to the Minister the death, removal or refusal to act of any member of the committee. g. To assist in supervising local examinations where assistance may be necessary. School committees may make preliminary arrangements for the establishment of boarding-houses in connection with country schools in sparsely-populated districts."